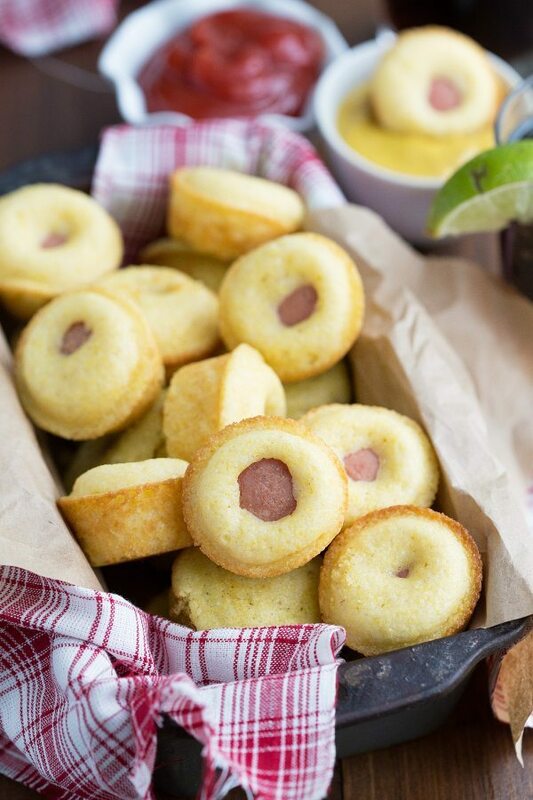 Tiny corndogs made in a miniature muffin tin with cornbread mix and chopped hot dogs. These are super quick and simple and the perfect appetizer for your tailgating parties! Who likes corndogs? I’ll start – I do not like them!! In fact, my whole family is probably rolling around laughing that I have a corndog recipe on my blog. When I first started dating my husband, his quick meal of choice was a corndog. He had a huge freezer package of them that he would warm up and eat all the time. I teased him constantly about the corndogs because I thought they were so gross. And my whole family knows that because they would tease him too. But these – I don’t really considered them corndogs because they are SO different and much better than corndogs. I really love these! 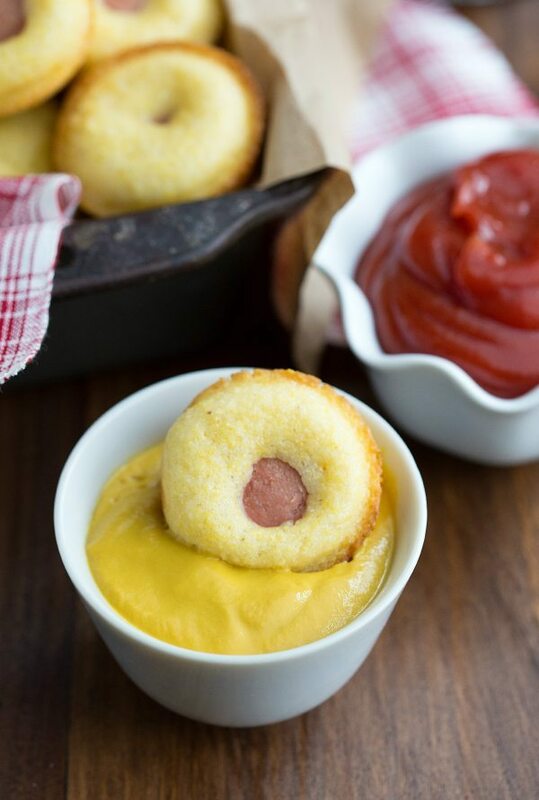 Cornbread is my favorite bread ever – so using cornbread to house a hot dog – that’s my kind of appetizer! Heck, I could even eat these as a meal. And with football season coming, these are going to be just the appetizer or meal you’ll want to make. I know I’ve said it here before, but I’m not really into football as far as the actual sport and watching it. But I heart football season. To me, football season has lots of good memories – time spent with my family all enjoying greasy and bad-for-you food. Cause nothing says football like chicken wings and covering everything in loads of bacon. And you can’t forget the hot dogs! So although I’m not following certain teams or cheering anyone on really, I’ve got these super simple miniature corndogs to make the whole experience even more fun. These are one of the easiest tailgating recipes out there! 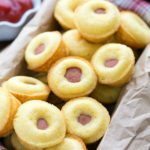 To make these as simple as possible, I started with a cornbread package, added the ingredients, stuck in the chopped up hot dogs and they are ready to go into the oven! The dipping sauces are easy too – just some ketchup and mustard and this party is ready to get started! Happy tailgating! Preheat the oven to 375 degrees F. Generously grease a miniature muffin tin with cooking spray and set aside. Prepare the corn muffin mix according to package directions. Fill each muffin cavity a little under 2/3rds the way full. 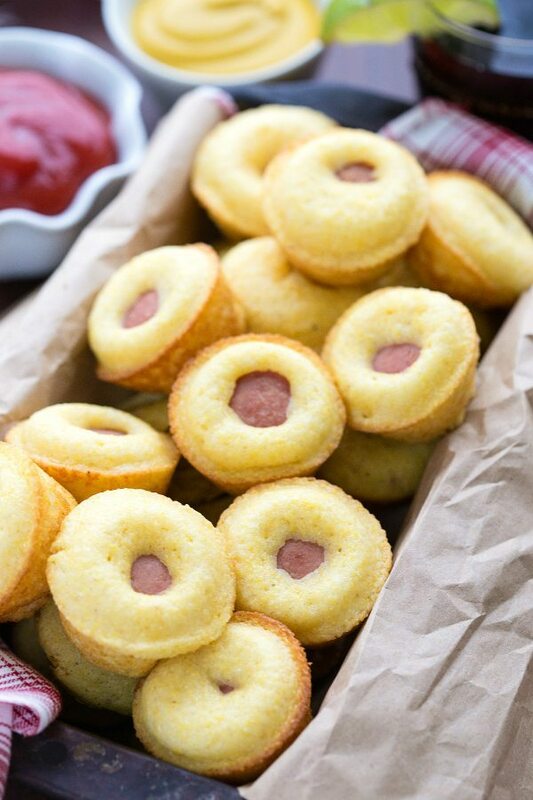 Cut each hot dog into 6 even pieces and then press one piece into the center of the cornbread batter. Bake for 10 to 12 minutes or until golden brown around the edges. Allow to cool for about 2-3 minutes and then use a spoon to ease them out. Serve while warm with ketchup and mustard! I want some of these! I’m with ya on football…I could care less about the game, but I love that it brings people together and it involves great food. I once hosted people just so I could have an excuse to make a huge batch of pulled pork 🙂 But I’ll make these next time, yum! 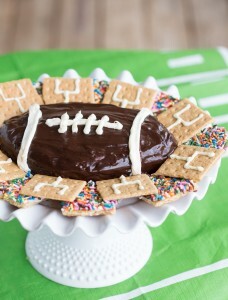 This is such a perfect snack for football season! My husband would love these little cuties. Love that you used cornbread mix and they’re a breeze to whip up! Pinned! Oh my gosh. I am soooo in love with these, Chelsea! These are so much better than the prepackaged frozen stuff. I think you may have inspired me to go crazy in the kitchen this weekend for the football games! Pinning! Hahahaha! I LOL’d at this post Chelsea. I’m sorry, but every once in a while, everyone needs a corndog. 🙂 I don’t eat them very often, but every once in a while (usually at a Fair), I get a craving for one and the next thing you know, I have a corndog and lots of mustard in hand! 🙂 I would love a delish version that I could eat ANY time. Pinned! What a fun and easy way to enjoy one of my favorite treats! I’ve made these before and love how simple they are. Hebrew National really are my favorite. Have a beautiful weekend girl! Cornbread is my favorite bread as well! Not too sweet but still a bit savory. Appetizer or meal, I am all over these. Pinned! I don’t like corn dogs either, but I would absolutely try these – they are so adorable, how could they not taste delicious?! 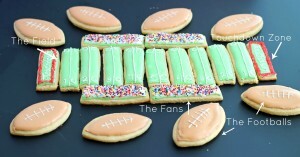 What a fun football recipe!